Social media is the forum where spontaneous gems like one UK journalist's video of an impassioned speech, a voice of reason, amidst utter mayhem can get captured, posted and spread like wildfire. Amidst the hundreds of images, tweets, blogs and overall reports coming out of London surrounding the violent riots and looting that began on Saturday, a raw, passionate outcry by a "fearless West Indian woman" has been rising above the rest on social networks. A TwitVid shot by Matthew Moore, a journalist at UK newspaper The Daily Telegraph, shows woman from Hackney scolding youth for their violence after two days of fiery, property-damaging, looting chaos. Although Moore didn't get a chance to identify the woman after he filmed her, The Australianreports it has identified the mysterious lady as Pauline Pearce, a mother of four from Hackney who felt people's anger over the incident were using it as an excuse to incite violence. Moore's now-viral upload was accompanied by a tweet that read, "Truly extraordinary speech by fearless West Indian woman in face of #Hackney rioters. Pls watch." "That woman in the shop there, she's working hard to make her business work and you lot want to and burn it up, and for what? Just to say that you're warring and you're bad men?" she shouts in the video. "This is about a f---ing man that got shot in Tottenham, this isn't about having fun on the road and busting up the place." "Get it real, black people, get real. If we're fighting for a cause, then fight for a f---ing cause." "You lot piss me the f--k off. I'm shamed to be a Hackney person. Because we're not gathering together and fighting for a cause. We're running down Footlocker and thieving shoes." 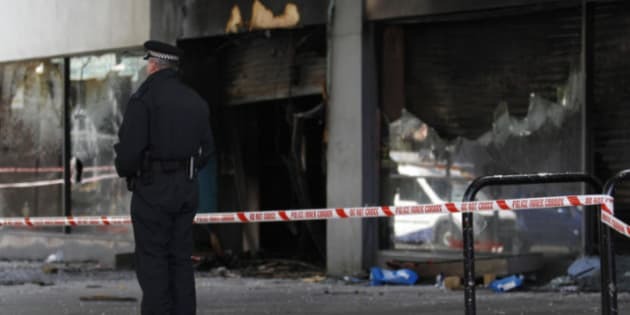 The violence erupted late on Saturday following protests over the controversial shooting of 29-year-old Mark Duggan on Thursday. Although we've recently seen several game-changing examples of social networking sites like Twitter and Facebook, as well as instant messaging with mobile devices, working as powerful tools to help mobilize like-minded protestors to achieve revolutionary movements like in Egypt and Tunisia, we're also beginning to see how these tools can be used to bring together like-minded sh*t-disturbers and work as a sort of accelerant to violent riots spiraling out of control (like we recently also saw in Vancouver, B.C. following the Stanley Cup finals). However, the Internet and social media are also exactly the forum where spontaneous gems like Moore's video of an impassioned speech, a voice of reason, amidst utter mayhem can get captured, posted and spread like wildfire through online networks. At the time of writing this article, the video has been online for about nine hours and has surpassed 770,000 views. Within the span of 45 minutes I've seen Moore's original TwitVid jump up by over 50,000 views. Written by Anastasia "Nat" Tubanos.